Two NASA astronauts switched their spacesuits to battery power this morning at 8:04 a.m. EDT aboard the International Space Station to begin a spacewalk planned to last some six and a half hours. 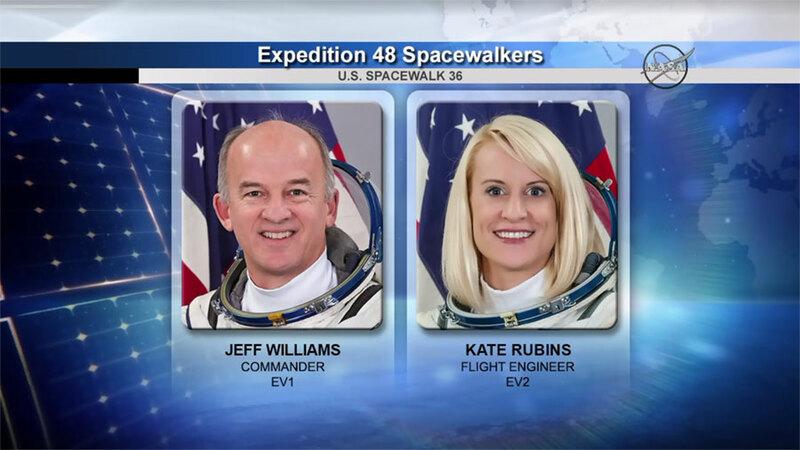 Expedition 48 Commander Jeff Williams and Flight Engineer Kate Rubins will install the first of two international docking adapters (IDAs) that will enable future arrivals of Boeing and SpaceX commercial crew spacecraft. The docking adapter arrived to the space station July 20 on a SpaceX Dragon cargo resupply spacecraft. On Wednesday, ground controllers used the Canadarm2 robotic arm, and its attached “Dextre” Special Dexterous Manipulator, to extract the IDA from the trunk of Dragon and position it just 2 feet away from Pressurized Mating Adapter-2 located on the forward end of the Harmony module. Once the IDA is moved to a surface to surface contact with the PMA, Williams and Rubins will begin work to hook up tethers in advance of Japan Aerospace Exploration Agency astronaut Takuya Onishi sending commands to close the hooks between the two docking ports. Once the hooks are closed, Williams and Rubins will press ahead to mate power and data connectors for future use of the IDA.